Received 25 September 2010; revised 12 October 2010; accepted 18 October 2010.
little by exercise habit s.
in various environments and to practicing healthy habits. may reduce these fatigue symptoms. life-style related diseases due to increasing inactivity [ 4]. and als o negatively a ffect daily li ving habit s .
building up resistance to it. exercise habits has not been well examined. lingness, drowsiness and uncomfortable physical feeling. fitness, except for curricular class. 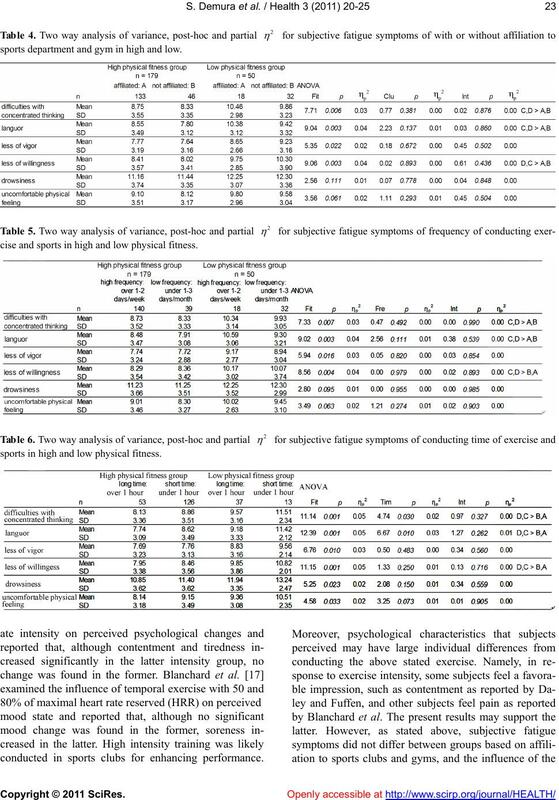 exercise and sports and duration of exercise and sports. without affiliation to sports department and gym. quency of conducting exercise and sports. ducting time of exercise and sports. sports department and gym in high and low. 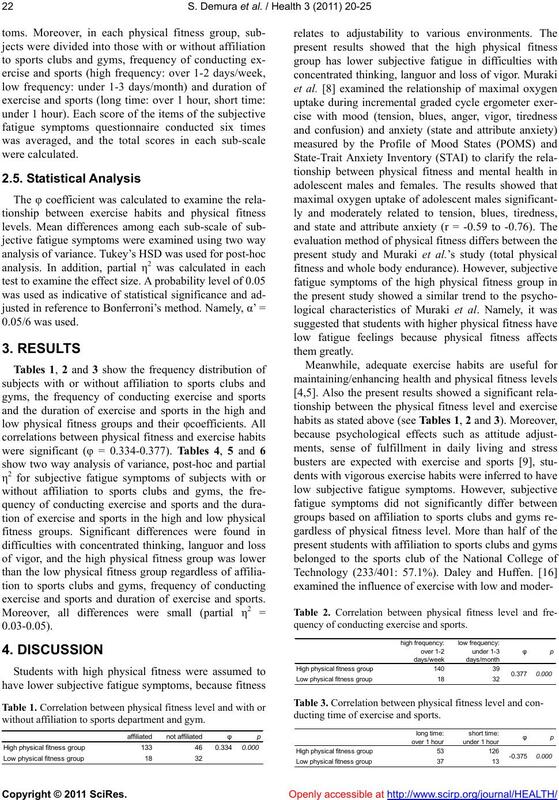 cise and sports in high and low physical fitness. sports in high and low physical fitness. conducted in sports clubs for enhancing performance. that 21 minutes of exercise is required to reduce anxiety. exercise more than 3days/week (150/401: 37.4%). proposed by the above previous studies (over 30 minutes). school students — A study by quantification method II. Japanese Journal of School Health, 32, 239-247.
dents. 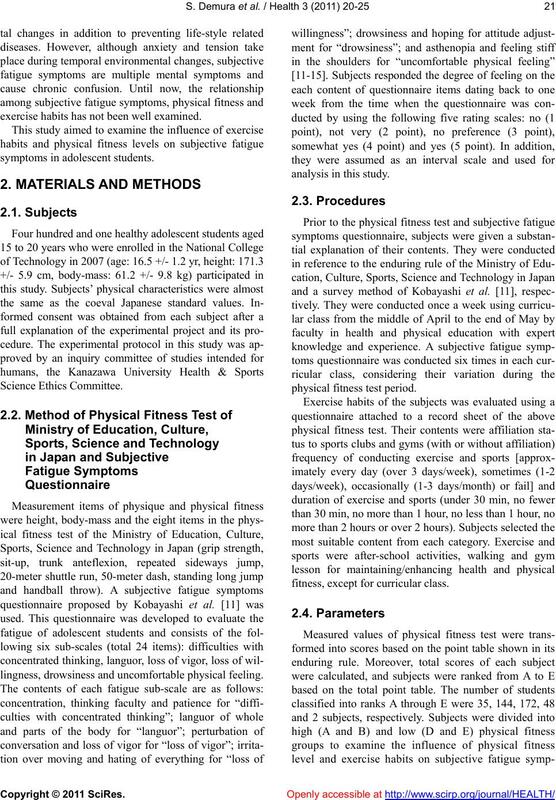 Japanese Journal of School Health, 40, 15 0-158.
elderly’s physical fitness. Journal of Health, 37, 658-661. 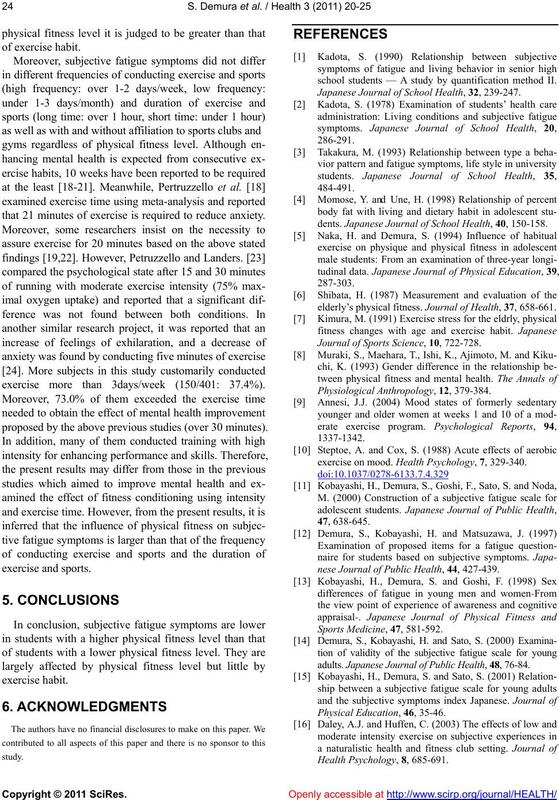 Journal of Sports Science, 10, 722-728.
exercise on mood. Health Psychology, 7, 329-340.
nese Journal of Public Health, 44, 427-439.
adults. 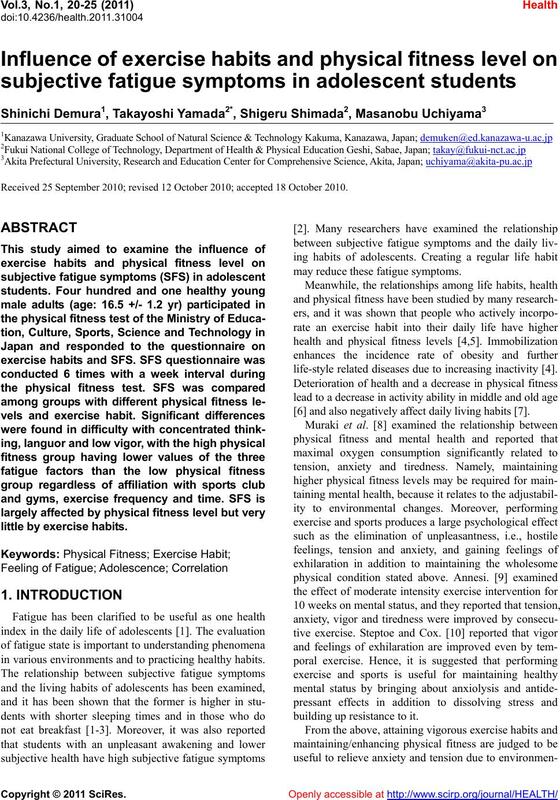 Japanese Journal of Public Health, 48, 76-84.
and Medicine in Sport, 4, 30-38.
xiety-reducing effects of acute and chronic exercise. K.M., McDowgall-Wilson, I.B. 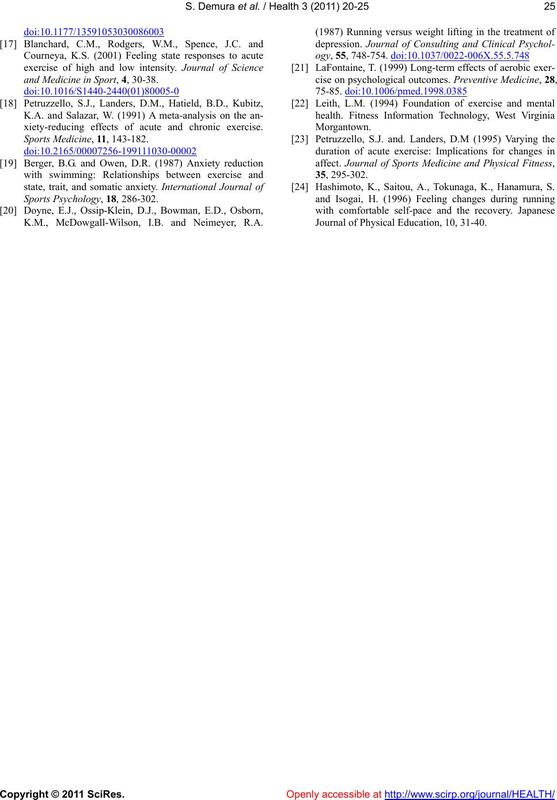 and Neimeyer, R.A.
 Hashimoto, K., Saitou, A., Tokunaga, K., Hanamura, S.
Journal of Physical Education, 10, 31-40.